Egg provides many health benefits as a food. It is rich in proteins. But this amazing food egg can be also used to get beautiful healthy skin and hair. Batter egg white and apply it on the face. Let it dry for 10 – 15 minutes and wash it with lukewarm. 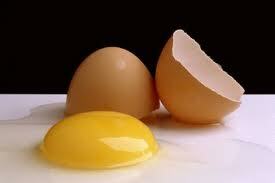 Egg white can also reduce swelling or puffy under eyes. Apply egg white under eyes and clean it after 10 minutes with water. To get shining and oil free skin, add few drops of coconut oil to egg white. Apply this egg white for face and neck. Wash it after drying. Add tablespoon lemon juice and olive oil to egg yolk (yellow). Apply this mix on the face and after drying wash it with lukewarm water. This will help people suffering from dry skin. Mix egg white, honey, olive oil and Rosewater together and apply it over the face and clean after 15 minutes to prevent dark spots on the face. Eggs are used in hair care extensively. Using it regularly for hair care will help in prevent hair damage, hair loss. Add 2-3 tablespoons of curd, olive oil, almond oil to egg white. Apply this mixture to hair and wash it off with water after 45 minutes for beautiful silky hair. To prevent hair fall and increase hair growth, add 2-3 tablespoons lemon juice with egg white and apply it to the scalp. Wash after 30 minutes with mild shampoo. When applying henna, mix egg white to the henna paste for more smooth and silky hair.